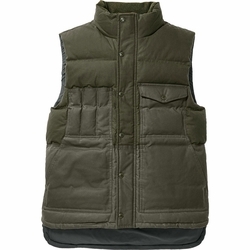 Filson Down Cruiser Vest. Filson's Down Cruiser Vest is a warm, versatile layer than can be worn on its own in cool temperatures or under a jacket when the snow flies. The wind- and water-repellent oil finish Cover Cloth exterior is reinforced with oil finish Shelter Cloth on the pockets and lower back for increased abrasion resistance. Fully insulated with lightweight, compressible 650-fill-power goose down.